American Mahjong (Mah Jongg or Maajh) differs from Asian forms of mahjong both in gameplay and scoring. The hands are highly pattern-based and change from year to year. American mahjong utilizes racks, joker tiles, and score cards in order to play the game – items not used in Asian mahjong. Distinct gameplay mechanics are the lack of chows and the ability to achieve more than four of a kind using jokers. During the 1920s when mahjong was first introduced to the United States there were many variations played. 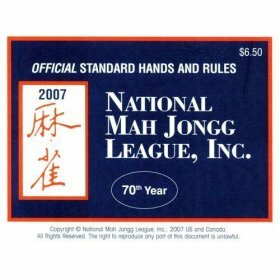 It wasn’t until 1937 when the National Mah Jongg League (NMJL) was established were rules and lists of hands standardized. To keep the game interesting the NMJL publishes a new set of hands each year. The NMJL is responsible for publishing the American version of the rules and supplies the Official Standard Hands and Rules Cards each year. Their website provides FAQs, answers questions and arbitrates disputes about individual games. One of the services it provides is the replacement of missing pieces. You can send in a request along with a single tile to best match the tiles needed. According to the official website the NMJL the League has started off with 32 members and has now reached over a quarter million. An american-mahjong-set would have all the necessary tiles (i.e. the inclusion of joker tiles). A score card, containing the hand and point values, will be required to play. Racks are also commonly used to straighten out the walls but are not pivotal to the gameplay. A series of tile passing prior to each hand. Nickname for White Dragon tile. For casual play, any seating arrangement will do. The dealer starts by rolling two dice. The indicated player rolls. The sum of the two rolls determines where the dealer breaks his wall. Counting from his right to the left the sum, the dealer takes the next two stacks of tiles (four tiles total). South then takes the next two stacks clockwise from the break. Next, west takes the next two stacks, and north takes the next two stacks. Repeat these steps two more times until each player has six stacks (12 tiles). Note that players take turns going counter-clockwise, and they take tiles going clockwise. This applies to dealing tiles as well as general gameplay. Lastly, the players take their final tiles as shown below. East takes two tiles, then South takes one, West takes one, and North takes one.